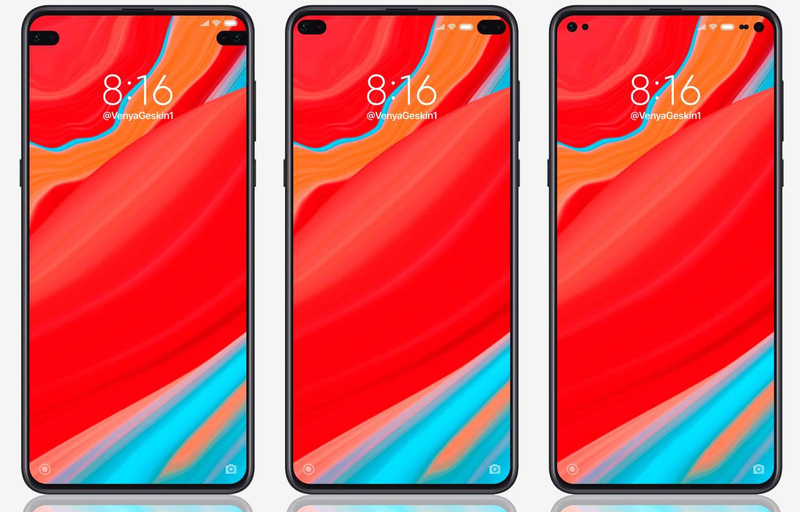 Forward-looking: Two recently discovered patents have painted a very interesting picture for Xiaomi’s 2019 and 2020 smartphone line-up. In short, they’ve copied the two flagship design features from the upcoming Samsung Galaxy S10 and dialed them up to eleven. The first patent, as seen in an artist’s render above, uses a punch-out on either side of the phone to make it look more symmetrical or to add cameras. The leftmost one is admittedly quite ugly, with two ‘side-notches’ that sit beneath the notification bar and dig into the main display. It does allow for four selfie cameras, however. The middle design basically mirrors the S10+ display with four cameras across two punch-outs in the notification bar. Size-wise, it’s equivalent to a fairly large notch but it doesn’t look too bad. The last design is clearly the better of the three, and it basically spaces out the two selfie cameras to make them more symmetrical and to conceal them. In addition to the three above, the same patent also outlines a punch-out for the earpiece that would embed the tiny speaker in the center of the notification bar. While this looks fine, it’s rendered obsolete by advancements that have squeezed the earpiece into just a couple millimeters within the top bezel. A second patent, discovered by LetsGoDigital, shows a phone with a screen that curves over the top and sides of the display and doesn’t have any notch or punch-out at all. While this is undoubtedly the endgame of the bezel-less trend, it does pose some challenges. Judging by the image, the display seems to curve around a lot more than any other phone, and that’s left no room for buttons. There’s an easy solution to this, however: because the display is touchscreen, it could simply register taps where the button should to be and respond with haptic feedback. Once again, because the non-screen area is so thin, there’s no room for either a headphone jack nor earpiece, and the speakers will inevitably be woeful. It will be interesting to see how Xiaomi tackles those challenges if this device ever comes to market. While there’s no camera on the device, that doesn’t pose much of a problem for Xiaomi, who was the first to market with a notch-less, hole-less, bezel-less display in the Mi Mix 3 - the first of a new generation of sliding smartphones. Given how fast the smartphone market is moving, it’s possible the second patent could arrive as early as the beginning of 2020 with the Mi Mix 4. The first patent, on the other hand, requires no real advancement over current technologies and could appear in a matter of months.